Q: What desktop application will include the Ubuntu One Music Store? 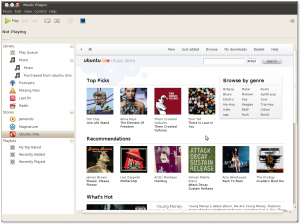 The standard Ubuntu music player, Rhythmbox, will be used for the music store. We know that people still want choice in their music player application so The Ubuntu One Music Store was developed as a plug-in that can be re-used in some other music applications. We have received approval from the music labels for the Ubuntu One Music Store to be embedded within Banshee, Amarok, and a few other applications. Please contact the Ubuntu One Music Store team for information about this process and implementation support. Canonical’s sticking point at the moment is that the alpha testing population was relatively small, and they only have a month until Lucid is released. This leaves them in great need of a vast amount of feedback, in a short space of time. As such, they are calling for as many vocal beta testers as they can get. Advice on setting up the beta-version music store and giving feedback was posted by blogger, Popey. There are some interesting cost implications here. In the short term, there are no official gratis downloads for beta testers. Although, 7digital always has a selection of free tracks, so people can test out the buying process without spending their own cash. In the long term though, Ubuntu One users are only given 2GB of storage for free. Considering that Ubuntu One is for storing anything that a user wants to keep in the cloud, they could soon run out of space. If so, they will find themselves having to buy more storage space, just so that they can buy more music! Time will tell whether users find this to be a cost-effective way of managing their data. Finally, trust the record labels to come in and spoil the party; international restrictions will apply, just as with services like Spotify. The US, UK and Germany will get the best deals, having access to all four major labels and the independents. This is great news. I wan't going to download the ubuntu beta, but this makes it more interesting. Question – Why MP3? I'd've expected ogg format. I think it's the only format the 7Digital supports, they are the white label service that Ubuntu One Music Store is using.